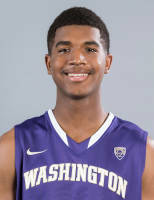 Strengths: Marquese Chriss has had one of the biggest jumps in the 2016 draft board with his stellar freshman campaign that has put him in the running for lottery pick contention. With a combination of length, athleticism and versatility, the 6'9" power forward has shown there isn't much he can't do on the floor. Offensively, Chriss is a solid threat inside that can also stretch out to three-point line and knock shots down. He's an explosive leaper with good hands and has solid footwork and mechanics. He may fit today's age of stretch fours in the NBA with his ability to space the floor and make athletics plays off-the-dribble. With his huge upside (wingspan of 7'1"), he's also an excellent shot-blocker defensively and can rebound the ball efficiently. He's still a very raw talent overall, but what else can we expect from an 18-year-old? The team that drafts him will have to be patient with him and let him learn through the growing pains. Weaknesses: When Chriss can stay out of foul trouble and stay focused to the task at hand, he's a notable two-way player. A blaring concern with him, however, is that he often struggles to defend without fouling. Since he hasn't fully physically developed, Chriss also needs to add more strength to his body to be able to match up against the bigs at the next level. If staying out of foul trouble is hard for him at the college level, imagine matching up against a bigger forward in the NBA? His offensive repertoire is his strongest asset overall, but it it's still very raw and needs to get polished up with more in-game experience. As mentioned, teams will have to be patient with his growth. Dejounte Murray & Marquese Chriss Washington Highlights 3.10.16 vs Oregon - 32 Pts, Freshmen-Duo!